Welcome to our new website, isn’t it gorgeous! I am lucky enough to work with a wonderful web designer, Laird Sapir at memphismckay.com. After she did such an amazing job with writerscoloringbook.com I asked her to help give “le blog” a make-over and this is the result. Not only does she have a great eye, she’s a dream to work with. And you can all see that yes, I’ve published my first book. 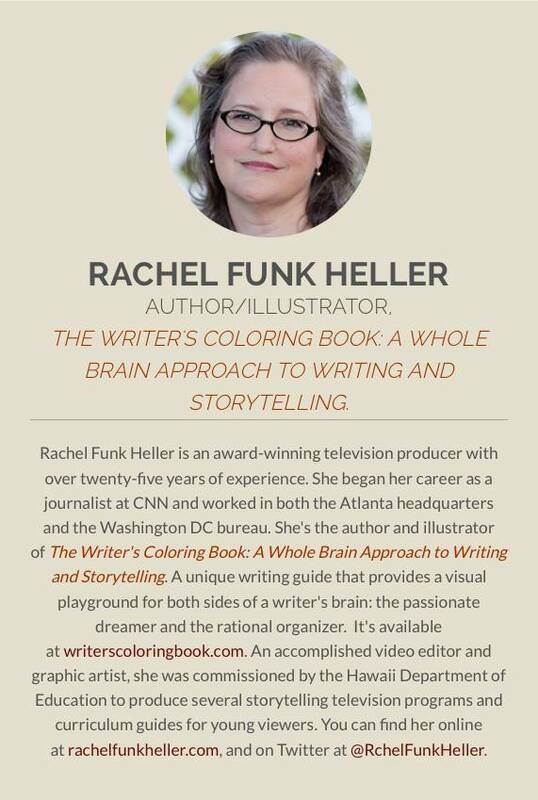 We launched “The Writer’s Coloring Book” back on April 1st—no fooling around here— and had a wonderful response. Friends, and friends of friends came out for the launch. I was shocked that so many people responded. I was lucky enough to take a quick trip back to Atalanta, Georgia. I lived there from 1986-88 when I worked at CNN. 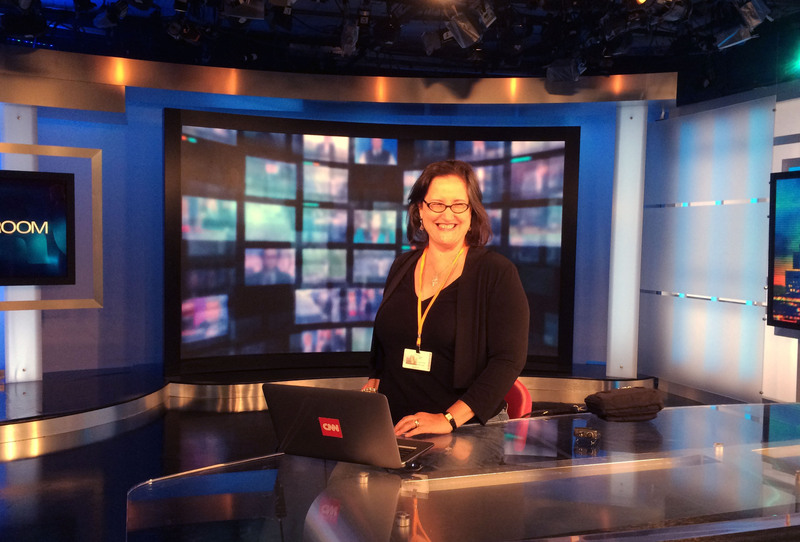 My dear friend Deb Calvin took me through CNN International. I have to say the place has certainly changed over the years. And of course, I had to sit at the anchor desk just for fun. I was there to help celebrate CNN’s 35th anniversary. There was a huge party–a high school reunion on steroids–where I was able to meet up with old friends and colleagues. Every minute you’d turn around and there were more and more wonderful people to catch up with. The party raged on until eleven, then it moved down to the bar, and then it moved to a private suite. Haven’t been out that late in forever…. Not since I worked at CNN. I missed my calling, I coulda been and anchor bunny. Thrillerfest: July 7-11 in New York City. Come see me at the VWTapes booth. 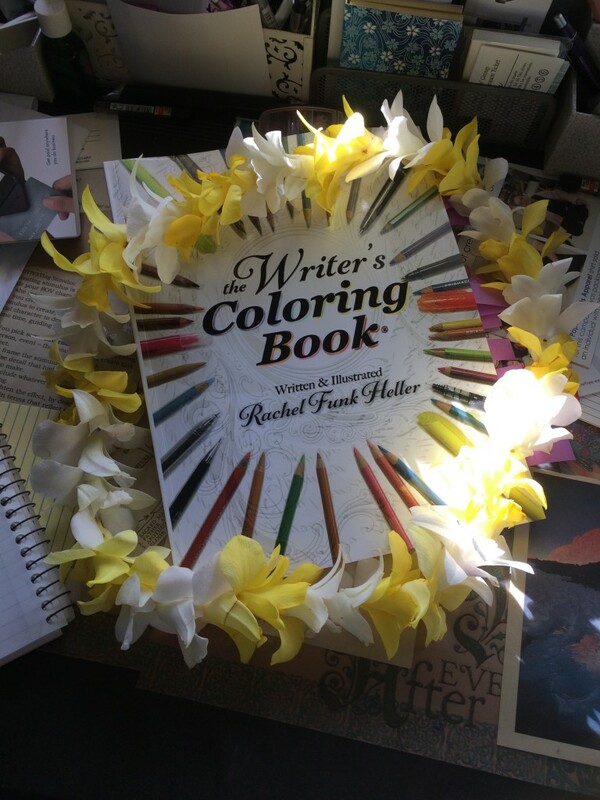 Copies of “The Writer’s Coloring Book®”will be on sale in the bookstore. Pacific Northwest Writers Conference: July 16-19 in Seattle, WA. 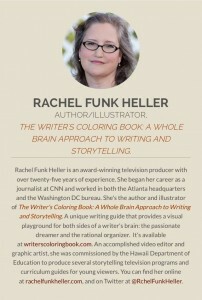 This is how I’m listed on the Writer’s Digest list of speakers. Thanks to Keith Slover for making this. I’m packing my bags full of special swag that I’ll premiere while on the road, don’t worry I’ll post lots of photos here. What do you think of the new site? Is anything missing? want more, or less? I love hearing from you folks, you are the best peeps on the planet. Thanks for stopping by, I’ll catch you on Facebook and Twitter.